As the Canva engineering team continues to grow, we’ve started to codify some of the “tribal knowledge” that previously went unspoken. This post is our attempt to describe the practices we’ve found help us work more efficiently as a team. It’s been really useful so far as a survival guide for new engineers, so we thought we’d share it. This isn’t meant to be a prescription for every team; it’s just what works for us. 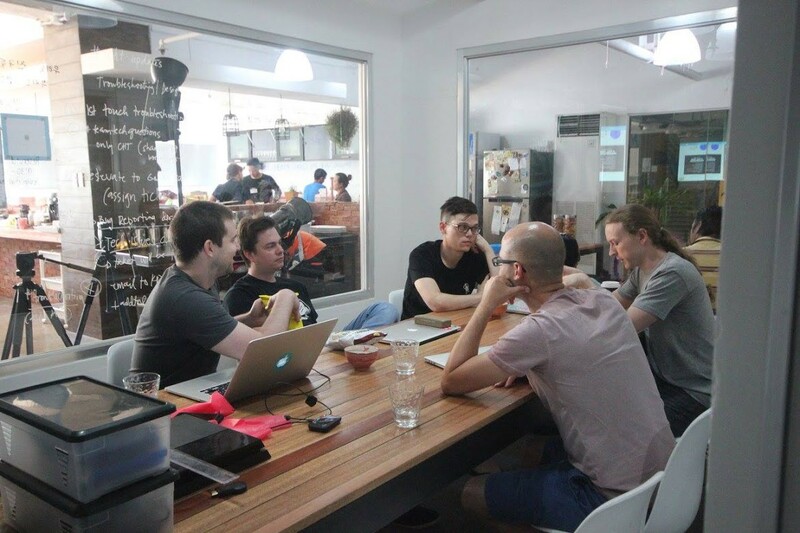 Each small team within the Canva engineering team has a weekly planing meeting. This is the infrastructure team. Round the table from the left: Jim Tyrrell, Damon Oehlman, Chris Doble, Dave Hearnden and Max Scheffler. Photo by Kat Sales. Every Monday, each feature team lays out the rough trajectory of work for the week sprint. Each of our deployable components has a baseline weekly release cycle synchronized with these sprints (some components release more regularly on top of that baseline). These sprint planning meetings are the primary means for communicating the latest priorities. We try not to get too hung up on the specifics of formal agile processes, but it’s a familiar practice to anyone who’s experienced agile before. Related trivia: We name our releases alphabetically. We’ve recently done “cheese of the world”, “muppets characters,” and “Crayola colours.” We’re in the middle of an Australian slang themed set of release names that has included “mozzie” (meaning mosquitoes) and “ripper” (meaning really good). Design docs clarify domain models and implementation strategies for non-trivial things, allowing them to be communicated effectively between several people over time, and in order to put subsequent coding in context. We keep design docs in a shared Engineering folder on Google Drive, where everyone on the team can find and edit them. We keep the feedback cycles minimal; on the rare occasion when an issue is going in circles, we resolve it in-person at a time of mutual convenience rather than engaging in long discussion threads. Each language we use has an internal style guide, and each guide is a living document that evolves through consensus from those on the team who use that language. We keep those guides in a github repo and in Confluence, and propose changes, through pull requests. Email is our primary tool for reliable asynchronous communication. If you need someone to read something, it’s best to send them an email. In particular, we strongly suggest not using chat services for anything that can’t be ignored or can’t be answered quickly and succinctly. We recommend everyone brushes up on how to use an email client effectively (e.g. keyboard navigation in Gmail) and checks their inbox regularly, at least hourly during work hours. For example, our CI system delivers notifications primarily over email. In order to push code, engineers need to be contactable by the system in the event of a break. In many chat tools, notification state is not preserved across network reconnection or signout/signin. If you send someone a message, you have no way of knowing if they’re ever going to notice it. We use Slack for transient, short-lived group discussion. We’ve found it to be an invaluable tool for having several vibrant discussions occurring concurrently, and allowing people who weren’t present at that time to peruse the discourse at a later time. No one’s obliged to use it, but pretty much everyone does. There are more serious rooms for asking questions, and sillier rooms for posting the latest cat GIFs and memes. If everyone in the room suddenly starts laughing, it’s probably because of something on Slack. We keep each other up-to-date through things like small standups, daily conversation, Slack, code reviews, and JIRA. Sometime’s it’s as simple as leaving a message in the team’s Slack room every few days. All day, every day, most of us are busy doing something. Our open plan office is great for camaraderie and vibe, but it can sometimes make it difficult to focus, especially if you’re working on a task that requires deep concentration. Some people hold a lot of context in their working memory at any one time, others don’t. Some people welcome interruption, others don’t. To work together effectively, we ensure that everyone is aware of the almost-universal-but-usually-unspoken ways that engineers work day to day. If someone’s displaying the above behaviour, we try not to interrupt them verbally unless it’s urgent; IM is preferred (which means there’s a responsibility on everyone to check IM periodically, even when they’re the one trying to concentrate). Concrete floors are great for skateboarding; less great for acoustics. Extended conversations around the desks can break the concentration of everyone nearby. We often take discussions into small meeting rooms instead, or having them in Slack so others can benefit from what was concluded afterwards. These are not the Canva Commandments of “How to be a Good Engineer,” but rather just a list of principles that we have been applying consistently, and help to paint a picture of our engineering philosophy. We find this helps new people understand how decisions have been in the past (and how they continue to be made), and context for expectations when collaborating and code reviewing. It’s best to always have a clear understanding of the precise problem you’re trying to solve, particularly in terms of a user story, and keep referring back to that precise problem. Try to avoid phrasing problems in ways that presuppose a solution. If you start a conversation with someone at Canva with “how do I make X do Y?”, they’ll usually reply with “what problem are you trying to solve?”. Things move very quickly here. We try to aim for the smallest, simplest change that meets requirements, while keeping in mind what the bigger, better way would be if it becomes a priority. Our priorities change weekly, if not daily, so any task that takes more than a few days runs the risk of being wasted work. It’s never good to reinvent the wheel. Our default strategy for solving any problem, somewhat tongue-in-cheek, is to look for someone smart who’s already solved it before and copy what they did. In particular, if there’s already an overwhelming convention to solve a problem in a particular way, we err towards that convention. There are few problems that can’t be solved quickly by judicious browsing of Stack Overflow. By having a solid understanding of the real problem you’re trying to solve, you can use your judgement for whether there’s reason to break the trend. When a trend does need to be broken, we say go for it. We’ve found that these practices and principles have been working well for our team at its current scale (about 25 engineers across our web client, ios client, and backends), but according to the rule of 3 and 10, we’re expecting them to evolve significantly as we grow. This post was originally published on Canva’s engineering blog in August 2015. It has been updated slightly as the team has almost doubled since then. Articles, insights, updates, and musings from the team at Canva. Articles and posts from the Canva team.